Hiking & trekking, climbing, winter sport mountaineering, ice climbing, ski, scrambling, cross-country skiing, snowboard, off-piste skiing, rock, mountain bicycle, ski mountaineering. Useful info for ski and snowboard tour Iran. Guided ski mountaineering tours. Hiking & trekking and climbing tour organizer Mt Damavand. Iran mount winter sport, ski, snowboard and climbing tours. Darbandsar is a small private ski resort which is located in a Village with the same name on the slopes Mt Seechal, about 60 Km NW of Tehran in Alborz Mountain Range. It is among the 7 major ski resorts near capital city Tehran. Darbandsar Ski Resort is the second most challenging resort after Shemshak in Iran. You may ski from Dizin to Darbandsar, but go back by car! This resort is not crowded even during the peak of ski season, so if you prefer to do non stop skiing and without wasting your time in lifts queues, then this resort is the best choice. Darbandsard Village is not far from Damavand Mountain, so it is good place for practicing before attempting Damavand Ski Touring. A great number of ski lovers attend Darbandsard ski field. The resort offers good slopes for off-piste skiing and snowboarding. The region is fine for extreme skiers. Visit also Darbandsard Weather Forecast. Variable Snow and Ice conditions! There are good coaches to teach you ski too. 2nd choice in Roodbare Ghasran area. Different levels: from beginner to experts. lack of accomodation and a low capacity of car park. 6 Day Weather forecast and snow summary Darbandsar and Iran. Located in the Alborz Mountains, 60 Km northeast of Tehran, Village Darbandsar, State Tehran, Country Iran. Fly to Tehran IKA International Airport and then travel by road to the Darbandsar Village. Only accessible by road and can be reached by coach or car. The journey time is about 60 to 90 minutes drive from Tehran. After a heavy snowfall, snow chains are often necessary for the last part of the journey. There is no railway station in the area. Note, in winter after a snow or stone avalanche the Dizin Road may be closes to traffic. Nützliche Infos für Ski- und Snowboard-Tour Darbandsar Skigebiet Iran. Geführte Skitouren und Snowboardtouren Teheran. Wandern & Trekking und Klettern Reiseveranstalter Damavand Berg. Iran Wintersport und Bergsteigen Touren. Informationen zum Skifahren und Snowboarden Tour Iran Skigebiet. Darbandsar Ski-, Snowboard- und Trekkingtouren. Abenteuer Wandern & Trekking-Touren. Wandern und Trekking Touren Alborz und Zagros-Gebirge. Anspruchsvolle Skitouren. Ski Mountaineering Federation Resorts. Ecosystem, Fauna, Flora und natürlichen Sehenswürdigkeiten von Persien Touren. Darbandsar Skigebiet Wetter-und Schneevorhersage. Hamaloon Eisfall Teheran, Iran. 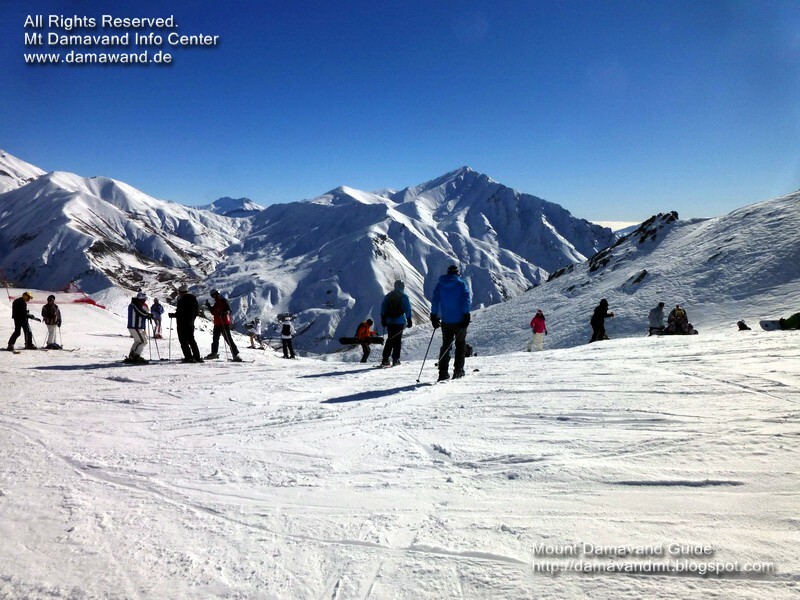 Useful info for ski and snowboard tour Darbandsar ski resort Iran. Guided ski mountaineering and snowboard tours Tehran. Hiking & trekking and climbing tour organizer Damavand Mountain. Iran winter sport and mountain climbing tours. Information for skiing and snowboarding tour Iran ski resort. Darbandsar ski, snowboard and trekking tours. Adventure hiking & trekking tours. Hike and trek tours Alborz and Zagros Mountains. Challenging ski mountaineering tours. Ski Mountaineering Federation resorts. Ecosystem, fauna, flora and natural attractions of Persia tours. Darbandsar ski weather and snow forecast. Hamaloon Icefall Tehran, Iran. Información útil para el esquí y el snowboard gira resort de esquí Darbandsar Irán. Guiados esquí de montaña y excursiones de snowboard Teherán. Senderismo y trekking y escalada gira organizador Damavand Montaña. Irán deporte de invierno y excursiones de escalada de montaña. Información para la estación de esquí del esquí y el snowboard gira Irán. Darbandsar esquí, snowboard y trekking. Aventura de senderismo y trekking. Caminata y caminata giras Alborz y Montañas Zagros. Desafiando excursiones de esquí alpinismo. Estaciones de esquí de la Federación de Montañismo. Los ecosistemas, la fauna, la flora y atractivos naturales de visitas Persia. Darbandsar tiempo de esquí y pronóstico de la nieve. Hamaloon Icefall Teherán, Irán. Infos utiles pour le ski et snowboard Tour Resort Darbandsar de ski Iran. Guidée de ski alpinisme et des visites de snowboard Téhéran. Randonnée et trekking et l'escalade organisateur de voyages Damavand Montagne. Iran sports d'hiver et tours d'escalade de montagne. Informations pour le ski et le snowboard tournée Iran station de ski. Darbandsar Ski, snowboard et le trekking. Aventure randonnée et le trekking. Randonnée et trek visites Alborz et Monts Zagros. Difficiles excursions de ski alpinisme. Fédération stations de ski alpinisme. Les écosystèmes, la faune, la flore et les attractions naturelles de visites Perse. Darbandsar météo de ski et de prévisions de neige. Hamaloon Icefall Téhéran, Iran. Informazioni utili per il tour di sci e snowboard Darbandsar sciistica Iran. Sci alpinismo guidate e tour di snowboard Teheran. Escursioni e trekking e climbing tour operator Damavand Mountain. Iran sport invernali ed escursioni alpinismo. Informazioni per località sciistica gita sci e lo snowboard in Iran. Darbandsar sci, snowboard e trekking. Avventura Escursioni a piedi guidate. Hike e trekking tours Alborz e Monti Zagros. Sfidare escursioni di sci alpinismo. Stazioni sciistiche Federation alpinismo. Ecosistema, la fauna, la flora e le attrazioni naturali di tour Persia. Meteo Sci Darbandsar e neve previsione. Hamaloon Icefall Teheran, Iran. Nyttig info for ski og snowboard tur Darbandsar skianlegg Iran. Guidet ski fjellklatring og snowboard turer Teheran. Fotturer og trekking og klatring tur arrangør Damavand Mountain. Iran vinter sport og fjellklatring turer. Informasjon for ski og snowboard tur Iran skianlegg. Darbandsar ski, snowboard og trekking turer. Eventyr fotturer og trekking turer. Tur og Trek Tours Alborz og Zagros. Utfordrende ski fjellklatring turer. Alpinanlegg Ski Mountaineering Federation. Økosystem, fauna, flora og naturattraksjoner av Persia turer. Darbandsar ski vær og snø prognose. Hamaloon Icefall Teheran, Iran. Полезная информация для лыж и сноубордов тур Darbandsar горнолыжном курорте Ирана. Руководствуясь лыжный альпинизм и сноуборд туры Тегеран. Туризм и треккинг и восхождение тур организатор Дамаванд горы. Иран зимние виды спорта и альпинизма экскурсии. Информация для горнолыжного курорта лыжи и сноуборд тур Ирана. Darbandsar лыжи, сноуборд и треккинг туры. Приключения пешеходные и пешеходные экскурсии. Поход и Trek туры Эльбрус и Загрос. Борьба горнолыжный туризм. Горнолыжные курорты Федерация Альпинизма. Экосистем, фауна, флора и природные достопримечательности Персии туров. Лыжный погода Darbandsar и прогноз снег. Hamaloon Icefall Тегеран, Иран. Poleznaya informatsiya dlya lyzh i snoubordov tur Darbandsar gornolyzhnom kurorte Irana. Rukovodstvuyas' lyzhnyy al'pinizm i snoubord tury Tegeran . Turizm i trekking i voskhozhdeniye tur organizator Damavand gory . Iran zimniye vidy sporta i al'pinizma ekskursii . Informatsiya dlya gornolyzhnogo kurorta lyzhi i snoubord tur Irana . Darbandsar lyzhi, snoubord i trekking tury. Priklyucheniya peshekhodnyye i peshekhodnyye ekskursii. Pokhod i Trek tury El'brus i Zagros . Bor'ba gornolyzhnyy turizm. Gornolyzhnyye kurorty Federatsiya Al'pinizma . Ekosistem , fauna , flora i prirodnyye dostoprimechatel'nosti Persii turov . Lyzhnyy pogoda Darbandsar i prognoz sneg . Hamaloon Icefall Tegeran, Iran .